It’s a well-known fact that a properly maintained garage can add serious long-term value to your property. However, if fallen into disrepair, or poorly insulated, garages can also act as parasites, siphoning off your fuel energy and allowing the elements in. Before insulating any garage, it is important to know what that garage is going to be used for. Garages can double up as workshops, exercise spaces and games rooms, offices and studios. To know what type of insulation to use it is essential to know what it will be required to do. There are many insulating materials out there and each has its own worth in certain conditions. But, there is no best material, only what is best in any given situation. What may be the best insulation for one customer could be the worst for another. The quality of the workmanship is as big a factor as the quality of the material used. For this reason, it is vital your building company is comfortable using your chosen product. Thermal insulation works on two fronts. Firstly, it keeps a comfortable temperature within the garage and, secondly, prevents an annexed garage from leeching energy from the main building. After all, your house will have had a whole series of good insulating measures incorporated into its design, yet, if your annexed garage in not insulated, all those benefits will go to waste. If, like me, you use your garage as a workshop and frequently play around with noisy tools in there, it’s necessary to isolate your garage phonically as well as thermally. After all, we can all do without the screeching of a drill or jigsaw in the middle of the afternoon! All garages need to be proofed against fire. But some, especially those garages I’ve mentioned above that double up as workshops, need extra protection. This is where product choice is key. What may be perfect for an exercise space may be far from ideal for a workshop or an artist’s studio. 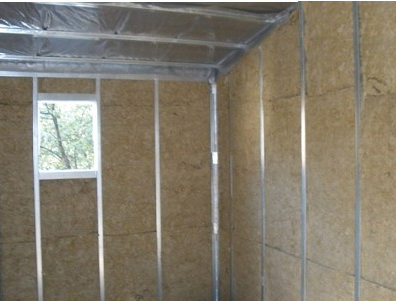 Although being the more cost-effective option, I personally only opt for EPS insulation with detached garages. Cheaper than the mineral wools, and easier to handle, EPS does not have good breathability characteristics which can lead to problems down the line. Still, because of its price and its excellent thermal properties, I do use it in specific circumstances. For customers on strict budgets who are dead-set on using EPS insulation, my advice is always the same: Do your research first. Not all EPS boards are of the same quality. Some companies, like Jablite, have advanced research and test programs and produce a far improved form of this insulation. For garages used as workshops or to store household products, I always use a form of mineral wool. It is a little pricier but offers up superior fireproofing and comes with the added benefit of having excellent soundproofing qualities. Another great advantage of mineral wool foam panels is that they offer a natural and solid support for the outer render. For a few quid, more you really can’t go wrong with this type of insulation. Although there is a myriad of different roof types, the most important aspect where insulation is concerned is flat or pitched. One of my main considerations when insulating a garage roof is ventilation. Poor ventilation, which can lead to water vapour permeating the internal finishes and insulation, is a cause of many garage problems. For pitched roofs, I always stick with my old faithful combination of Kingsspan Kooltherm K107 Pitched Roof Board between the rafters and Kooltherm K118 Insulated Plasterboard for the inside faces. To ensure that I leave sufficient ventilation space I often nail timber stop battens to the side of the rafters. The insulated plasterboard I place longways, running across the rafters. In certain instances, I opt for mineral wool insulation as it can be compressed and pushed in to provide a tight fit between the joists. For annexed garages with pitched roofs I’ve found that the Cerolex type stuff also yields great results. There are a couple of important factors to take into account when insulating a flat roofed garage. Flat roofs, especially with the UK’s ever-changing weather, are prone to pools of water forming on the surface. Such water pools pose insulation problems. Before I undertake any insulating on a flat roof I always verify the condition of the roof. Insulating a roof that has fallen into disrepair will result in a total waste of money. If correctly ventilated the vast majority of moisture that enters a garage will escape safely. However, a small amount may remain. A vapour barrier is essential to provide protection against mould or rot. Insulating a garage door is tremendously important. 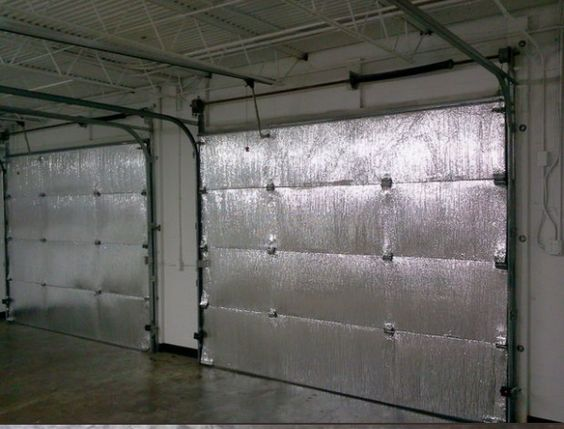 My personal preference, when possible, is to insulate garage doors with radiant barriers. Do keep in mind that such a method does not reduce heat conduction like thermal insulation materials. As previously mentioned: there is no best insulating material that is superior in every instance. The type of insulation I use will ultimately come down to my customer’s budget and needs. For most garages, I have a general preference for mineral wool. In the post above, I share with you my many years of experience as a local roofer in Newcastle and surrounding areas and the techniques that I have found to be the best way to insulate a range of garages. Don’t take my word for which insulation is the best for certain garages. Do your own research and learn the pros and cons of each material. Discuss your findings with your building contractor and take on board their advice. The important thing is that your garage is professionally insulated so as it neither detracts from the value of your property nor leeches away its energy and raises your fuel bills. It’s a case of the adage: spending money to save money. And, in the case of garage insulation, there’s never been a truer word spoken. Hi, we have a 7m x 4m outbuilding with a single pitch roof that i wish to insulate so that we can work in there occasionally and sometimes use for gym but mainly as a store. its a single block shell, with piers, and has been monocouche rendered. Whats the best insulation i should use for this?